In May and June, this low-growing, evergreen shrub is smothered in fluffy, powder-blue flowers. It is easy to grow and care for, and forms a natural mound, so looks best towards the front of a mixed border with a backdrop of larger shrubs. Garden care: Each year after the plant has flowered, take out any dead, diseased or damaged shoots. Apply a 5-7cm mulch of well-rotted organic matter around the base of the plant in autumn. It was as described and is settling in the garden very well. It's a good idea to plant it so it can lean on a wall (wall shrub style) as it does like it and a wall offers it nice protection. It has lots of buds already (first season) so I am looking forward to the heavenly scent soon. Efficient service and good quality plants! Very good quality plants that are delivered quickly and packaged professionaly. This plant has surprised us with it's growth - lovely plant for back of a raised bed. Usual Crocus high quality. Needed low growing, spreading and decorative shrub to fill bare corner in hospital garden. Attractive all year round. i bought this lovely shrubb last year and it suvived the winter but now all the leaves are dropping off and it was about to flower but now it looks like its going to die on me, what can i do? Hello, This could well be caused by the unusually dry spring we have had. I would give it a really good soak at regular intervals and it should start to pick up. Hello Liz, The sucess of this project will really depend on how long the Ceanothus has been growing there. If it is more than a couple of years, then it might be worth replacing it altogether as they tend to be rather short-lived (6 - 10 years or so). If you do want to tackle it, then autumn is the ideal time. Try to get as much of the rootball as possible, re-home it immediately and make sure it is kept well watered for the following year. What shrubs can you recommend to grow in large pots in a sunny position? Hello, Once you have your shortlist of plants you could draw the border out on grid paper allowing one square for 50cm or so. Then look at the eventual spreads of all the plants (we have this information on our site) and plot these out on the grid. I would certainly allow for overlap, but how much is up to you. As a very general rule, I would suggest up to 30%, but you can go even more if you are prepared to take things out as they grow. 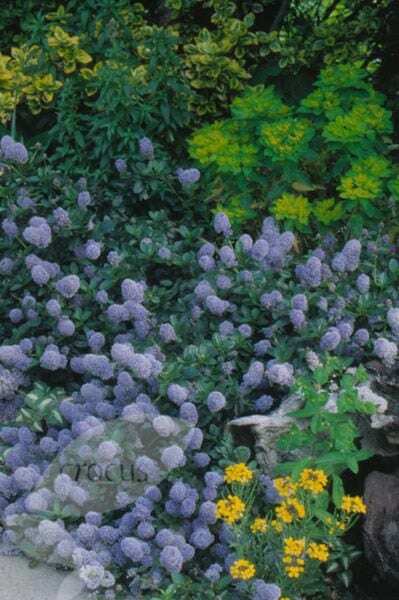 Hello Paula, All of the Ceanothus you have listed are upright and shrubby, so if you want to create a cascading look then the best option would be Ceanothus thyrsiflorus repens, which will tumble over the edges of the rings. What can I plant on my slope? I have a fairly steep bank of clay soil, which is in full sun most of the day. What do you think would grow well and provided easy maintenance. I would welcome any opinions you have. What is wrong with my Ceanothus? I moved to a new house last August and was pleased to see a good sized Ceanothus shrub in the garden as I love these. However this year after flowering it looks almost dead. All the leaves have dried completely and when I break the small branches they appear to have no moisture left in them. All the surrounding plants are fine. Do you think it will revive if I prune it? Ceanothus are not particularly long-lived plants so it may simply have just come to the end of its life - or it could have dried out too much this summer. I wouldn't recommend pruning it to try and revive it as most Ceanothus don't respond well to hard pruning, so if it looks really bad, then the best thing to do would be to dig it up and replace it with another.